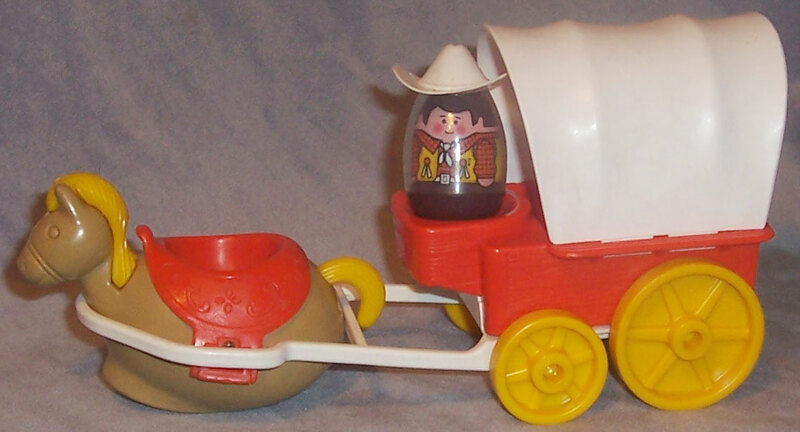 Description: This small western set includes the same horse, wagon, cowboy Weeble and cowboy hat that was sold in the #598 Weebles West. Wagon - HTW192 - Orange "western" wagon with molded "wooden" sides and wagon bed/floor. The wagon has a large white hitch on the front, rolls on 4 molded "spoke-wheels", has 1 rounded Weebles seat on the front, and top edge of the wagon bed has 4 rectangular holes to attach the removable wagon canopy. 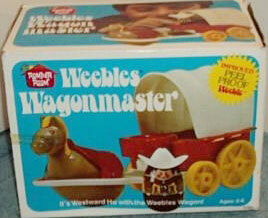 The bottom of the wagon, and all 4 wheels are marked, "©1974 Hasbro®, MADE IN U.S.A.". Measures 8-1/8" long, 3-5/16" wide x 2-1/4" tall. Wagon Canopy - HTW193 - Rounded white flexible plastic wagon canopy. Bottom edge of each side of the canopy has a small rectangular "peg" that fits into slots on the edge of the wagon bed. Inside of the canopy is marked, "©1974 Hasbro®, MADE IN U.S.A.". Measures 2-1/2" tall x 2-3/4" deep x 3-1/2" wide. Horse - HTW194 - Tan/light brown rounded horse figure with a yellow mane and tail and an orange 1-seat saddle. Measures 4-1/4" long x 2-3/4" tall x 2-7/8" wide. Western Dad - HTW13 - Brown base, brown top (hair) western cowboy man with an orange checkered shirt, white scarf, and yellow vest. The brown top (hair) area has 2 small rectangular holes (to attach a cowboy hat). Marked, "©1974 Hasbro". Measures 2" tall. Hat - HTW195 - Small WHITE molded plastic cowboy hat. The inside edge of the hat has 2 small "pegs" to attach the hat to certain Weeble figures (only attaches to Weeble figures with 2 holes near the figure's head) Measures 1-3/4" long x 1-1/2" wide x 1/2" tall (to top tip of hat). Featured in 1975 Sears Christmas Book (page 486) - Price $2.97. Featured in 1977 Sears Christmas Wish Book (page 491) - Price $3.45.